Worksheet given in this section is much useful to the students who would like to practice problems on angle relationships. Find the value of "x" in the diagram given below. In the diagram given below, l1 lines l2 are parallel and t is a transversal. Find the value of "x". In the diagram given below, a lines b are parallel and t is a transversal. Find the value of "x". In the diagram given below, find the value of "x". Let us look step by step solution for each problem given on "Angle relationships worksheets". 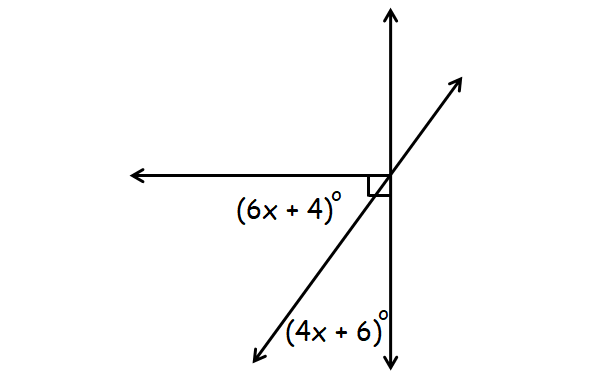 In the diagram above, it is very clear that the angle measures (6x + 4)° and (4x + 6)° are complementary. Hence, the value of "x" is 8. In the diagram above, it is clear that the angle measures (4x + 7)° and (6x + 3)° are complementary. 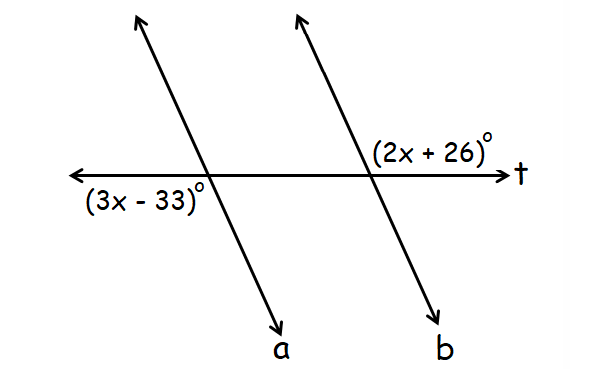 In the diagram above, it is clear that (2x+3)° and (x-6)° are supplementary angles. Hence the value of "x" is 61. 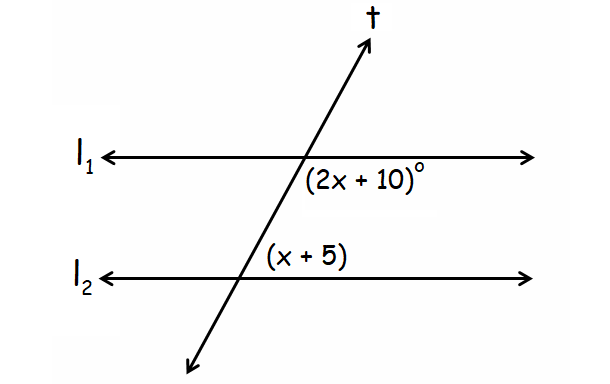 In the diagram above, it is clear that (5x+4)°, (x-2)° and (3x+7)° are supplementary angles. Hence the value of "x" is 19. 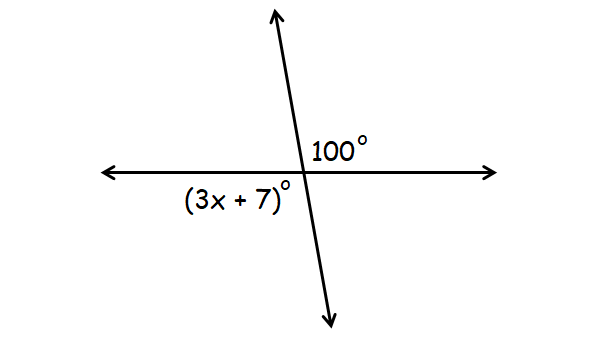 In the diagram above, it is clear that (3x+7)° and 100° are vertical angles. Because (3x+7)° and 100° are vertical angles, they are congruent. Hence the value of "x" is 31. 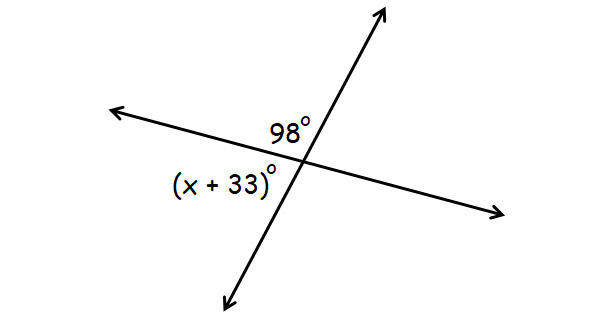 In the diagram above, it is clear that (x + 33)° and 98° form a linear pair. Subtract 131 from both sides. 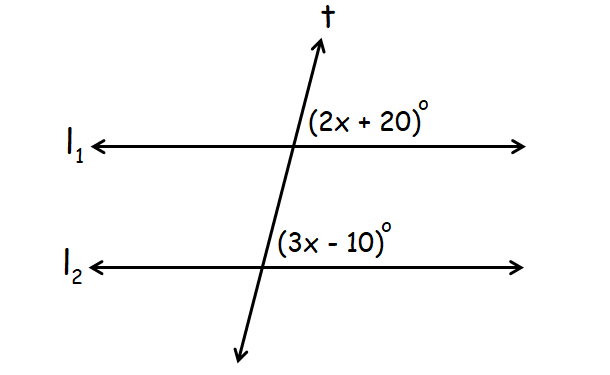 In the above diagram, (2x + 20)° and (3x - 10)° are corresponding angles. When two parallel lines are cut by a transversal, corresponding angles are congruent. Hence, the value of "x" is 30. In the above diagram, (2x + 10)° and (x + 5)° are consecutive interior angles. When two parallel lines are cut by a transversal, consecutive interior angles are supplementary. Hence, the value of "x" is 55. In the diagram diagram, (2x + 26)° and (3x - 33)° are alternate interior angles. When two parallel lines are cut by a transversal, alternate interior angles are congruent. Hence, the value of "x" is 59. In the diagram diagram, it is clear that AB||CD and AD||BC. So ABCD is a parallelogram. In a parallelogram, two consecutive angles are always supplementary. Hence, the value of "x" is 60. After having gone through the stuff given above, we hope that the students would have understood "Angle relationships worksheets"
Apart from the stuff given on "Angle relationships worksheets", if you need any other stuff in math, please use our google custom search here. After having gone through the stuff given above, we hope that the students would have understood "Relationships between angles". Apart from the stuff given on "How to measure an angle with protractor", if you need any other stuff in math, please use our google custom search here.